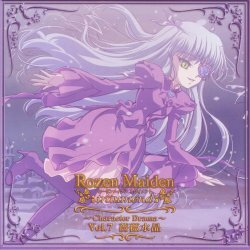 The Rozen Maiden Character Drama series finally draws to a close with the March 7, 2007 release of the seventh volume, devoted to Barasuishou. It is a two-disc release this time, with the second disc containing a compilation of bacground music pieces from all seven volumes. This was another drama that I personally found slightly disappointing, as I think there was so much more they could have done with the character, such as delving into the details of her life prior to encountering the Rozen Maidens. Other things I was hoping for as a long-shot were maybe an appearance by Kirakishou, or at least some more silly comedy pieces such as were in the Träumend original drama CD, but no such luck. It starts out promising, as we get to witness the birth of Barasuishou (somewhat bringing to mind Shinku's birth scene at the start of Träumend). But there didn't seem to be much more in the way of a coherent story or character development beyond that. Maybe Barasuishou is just too weak a character to develop farther than has been done already? The drama doesn't take place at a discrete time during the series, but rather jumps around the entire time frame of episodes 1 through around 8 or 9. Naturally, it will contain spoilers if you haven't watched the series already in its entirety. Download a plain ASCII version (*.TXT) of the entire script here (22 KB).